What an amazing hike this morning! After catching a few ZZZs, I woke up and got out of bed at 1am, hiked up Mt. Sneffels under a brilliant full moon, and topped out on the 14,156′ summit at 4:15am. The air was really calm and not that cold, and I had plenty of time to relax on the summit before the dawn light, enjoying the massive vista of moonlit peaks. 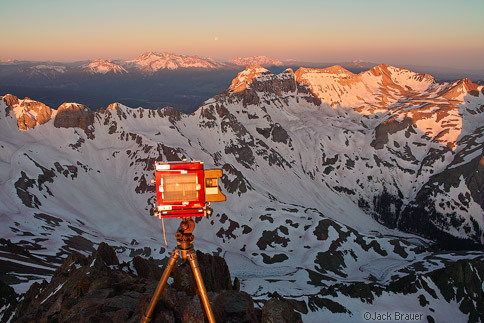 Once the sun started rising, the photography was fast and furious, and I got some good large format shots with the 4×5. Now I’m off to Boulder for my friends Santos and Jill’s wedding. Posted in Colorado and tagged 14ers, Colorado, San Juans, Sneffels on June 19, 2008 November 10, 2013 by Jack Brauer. This morning my friends Parker and Aimee and I hiked up and snowboarded down Mt. Sneffels, the iconic fourteener above Ridgway and Ouray. Oddly, this was only my second time on this local 14er; the first time was way back in June 2005 when I rode down a different line, also with Parker and Aimee. [+] Parker McAbery snowboards down Mt. Sneffels. 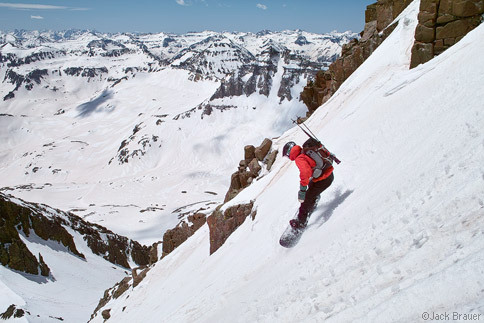 Posted in Colorado, Skiing/Snowboarding and tagged 14ers, Colorado, San Juans, Sneffels on May 29, 2008 November 10, 2013 by Jack Brauer.